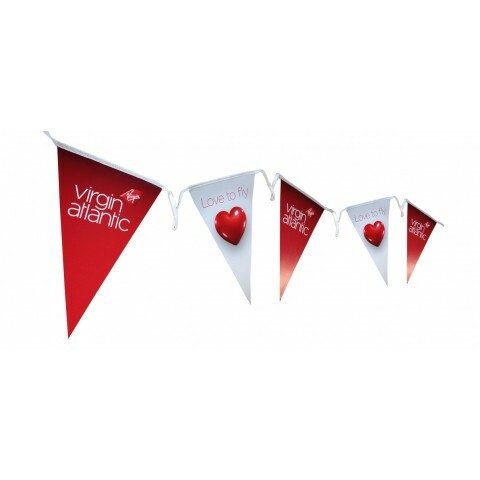 At a time when vintage and homemade items are in high demand, our Promotional Bunting is a great quirky accessory for any fete, fair or general frivolity. Why not give your street party a quaint British feel with some patriotic branded bunting, or bring your favourite storybook character to life for a children’s party? 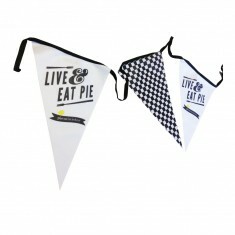 Our custom printed bunting comes in a wide range of options, suitable for outdoor and indoor use for wherever your event may be! 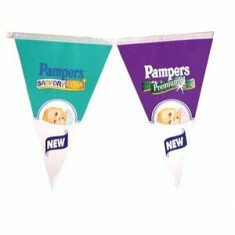 Printed in full colour, you can even print a different design to each flag for a truly unique branding opportunity. 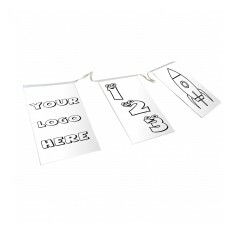 Customise the length, shape of flags and design for a one of a kind personalised bunting. Our personalised Outdoor Poly Bunting is a popular choice due to its versatility, making it great for those outdoor summer events where you can’t predict what the weather will do next! This particular bunting is made from polyolefin, meaning it can withstand even the most miserable of summer days, and has been a great hit with many of our customers. Why not request some samples and see the quality for yourself? Printed to both sides. 150gsm water resistant synthetic paper. Black or white nylon webbing. Uncoated paper. Printed to both sides. 115gsm paper. Express option available. 10 metre length. Indoor use. Triangular shaped flags. UK made. Printed full colour. 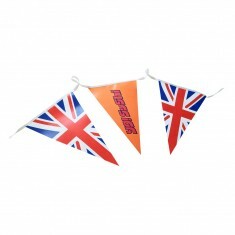 Polyester knitted bunting. Full colour print. UK made. Alternating print available. 356 micro polyolefin. Triangular flag shape. White or black nylon webbing. UK made. 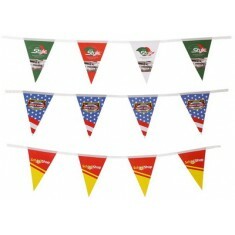 A4 or A5 indoor triangular bunting supplied in 5 metre lengths.